The most remarkable season during the Larry Eustachy Era just keeps getting more memorable. 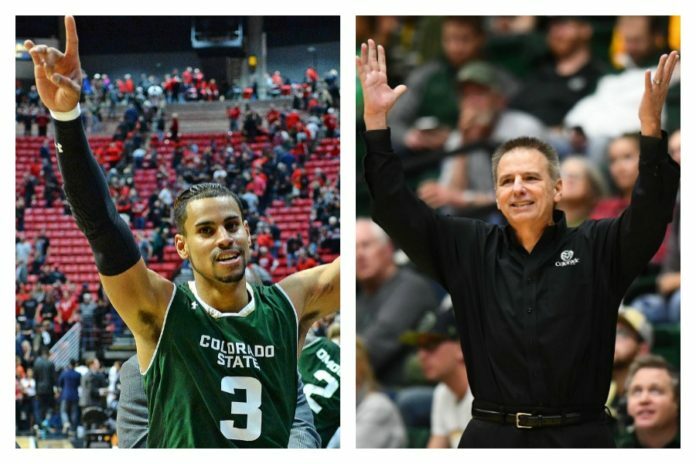 On Sunday, the Mountain West Conference announced Eustachy was named Coach of the Year, while Gian Clavell was named MW Player of the Year, both by the media. Eustachy – the man in black who loves Johnny Cash – certainly walks the line while coaching his team, hovering the border of good cop/bad cop all in one persona. During games, is tough on players players, sometimes humiliating them them by calling quick timeouts when they don’t play his brand of basketball. After games, he loves those same players, as we saw him kiss Prentiss Nixon on the right cheek following Senior Night and a 78-76 victory over Wyoming last Tuesday. Without a doubt, Eustachy is one of the most interesting characters in all of college basketball, a coach who chugs Diet Cokes and is crazed on the sidelines, often overstepping his literal boundaries onto the court. In his postgame talks with the media, he’s one of the best quotes in all of sports, as no one ever knows what to expect to come out of his mouth. Even if that means comparing himself to President Donald Trump, as he did multiple times this year, or exclaiming he doesn’t need to party with coeds anymore because “I have a hot wife,” a gem from last year. After losing three players due to academic ineligibility this season, after Emmanuel Omogbo‘s shouting match with New Mexico assistant coach Terrance Rencher, after Eustachy’s “culture of fear” was exposed as it was investigated in 2013-14, and after an unimaginable seven straight wins near the end of the season, only to fall one victory short of a conference title, Eustachy was named Coach of the Year. 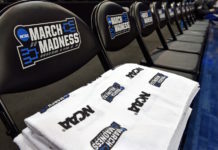 It’s ironic because some saw his lack of oversight a problem when three players – all JUCO transfers, which has been the main avenue Eustachy has pursued in recruiting new talent – were declared academically ineligible for the second semester of the season. That slashed the roster from 10 to a mere seven players – boosted up to eight with the signing of track athlete Juan Sabino II – and put the Rams between a rock and a hard place. Eustachy decided to go after four D-I transfers last offseason, a gamble which almost bit him when he had a mere seven players eligible. Those transfers had to sit the bench all year long, which was why CSU had only 10. And, really, that number was a mere nine players as Gian Clavell was suspended following an arrest for false imprisonment. Clavell sat out the first nine games of the year and then was reinstated, with the charges later being dropped. What Clavell – a redshirt senior who was also once a JUCO transfer and who was injured last year – did on the court this season was superb, and he clearly deserved the honor of Player of the Year. First and foremost, with only seven players on the team for most of conference play, Clavell’s importance was easy to see. Clavell provided the spark Colorado State needed on both ends of the floor. When he injured his shoulder and opted for surgery last year, he became extremely vocal on the bench. He continued that leadership on and off the floor this season; Clavell led by example on the defensive end by giving all-out effort and he simply took over on the offensive end, at times. Clavell finished the year averaging 19.5 points per game on the season, which is second-best in the Mountain West, while his 6.3 rebounds per contest rank eighth-best. In conference play only, he scored 21.2 per game, a Mountain West best, with 6.9 boards. A volume shooter, Clavell hoisted a ton of jumpers for the Rams this season, especially in the second halves of games. Maybe one of his most valuable aspects from a team perspective is his ability to allow teammates – namely Omogbo and Nixon – to get it going in the first half only for Clavell to take over in down the stretch. Facing the San Diego State Aztecs on the road, Clavell scored the final 12 points of the contest for the green and gold, including a coast-to-coast runner which allowed the Rams to win in San Diego for the first time since 2003. Against Utah State at Moby Arena, Clavell went on a 14-point tear to put away the Aggies in the second half of that win. On Saturday night, with his Rams looking to take the regular season conference title, Clavell scored 15 points with four rebounds in the second half alone as Colorado State couldn’t hold on to beat Nevada in Reno. 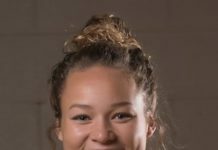 And, even with all that scoring power and ability, Clavell said after the win over San Diego State last Saturday, “I want to be first-team all defense.” He also made sure the local media all knew he enjoyed a career-high with three blocks on the night which brought “Moby Madness” back to the ancient arena for the first time in years. Eustachy led the Clavell-less Rams to an upset victory over Colorado in Boulder early on, as well as pushing the “Magnificent Seven” to road wins at SDSU, at The Pit in New Mexico, in Laramie, in Provo against Utah State and a road victory in Vegas over UNLV, too. The 7-5 road record is the second-best for a Eustachy-led Rams team, behind only the 2014-15 group who went 8-4 away from Moby. He also won his 500th game as a head coach and 100th as the Rams head man, this season. Now, Eustachy, Clavell and fellow first-team All-MW player Emmanuel Omogbo must go to Las Vegas for three more “road” games, and they must win them all, if the “Magnificent Seven” want a chance of getting to the elusive NCAA Tournament. Clavell himself told Mile High Sports Magazine before the season Eustachy’s harshness, his yelling, his demand for defensive excellence only makes the guard better. “He can be screaming at me, cussing at me, all he wants me to do is play better defense,” Clavell said. “All he wants me to do is take a better shot. All he wants me to do is be tough. That’s all. I like that. At 21-10 overall, 13-5 in the Mountain West, the “Magnificent Seven” blew past expectations, finishing as the second-best team in their conference. They did buy into Eustachy’s philosophies – of defense-only practices – and in turn, he bought into them (Clavell drew up offensive plays for the team multiple times in games). But, the business isn’t done. Clavell wants to make the NCAA Tournament – a preseason goal – and for CSU, their Mountain West Tournament tips off Thursday afternoon against either Air Force or Wyoming.